Three new businesses popping up on Penzance Prom will be a setting street food, hot drinks and cakes and ice cream. Cornwall Council described the three traders who won tenders in its pop-up site programme as “exciting”. It comes after cherished mobile business Little Wonder Café lost out on the bid after being there for five years. A spokesman said. 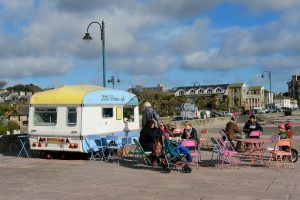 “In the last round of tenders for the Pop Up site programme, Penzance Promenade were awarded three exciting new pop up businesses. “These businesses have been chosen because they complement each other and the local area. “One business will be selling street food, another will be selling hot drinks and cakes and the third is a local business selling ice cream. Last month the town came together to say goodbye to Nic and Katie Lennon, who ran the Little Wonder Café. Following this news hundreds of loyal customers, local and those who have visited from afar, wrote to Cornwall Council. They demanded that the owners should be allowed to stay. Even the seagulls joined the fight. Be the first to comment on "Three new businesses popping up on Penzance Prom"